Right, first update on the art nouveau lady! I wasn't even going to attempt it because I'm working on 20 count, but I did manage (more or less) to do the fractional stitches on her eyebrow. It should be noted that I loathe fractionals and have been known to re-chart sections of designs I like in order to get rid of them because I have trouble not with the actual stitching but with reading them on the chart and translating that to the fabric. It's like a weird version of dyslexia, I get confused and can't make what I'm seeing make sense in my head. But I managed because it was only a couple of stitches. Yay! she's beautiful! keep up the good work, i'm excited to see her when she's finished. Thank you! Just hoping my sister will like her. I'm going to try to do an update post every week and I'm hoping I can keep on making good progress with her. She has quite an elaborate hairdo with lots of flowers and stuff, so her face was the most straightforward part. there are also a lot more small roses to do around the border. It's such a beautiful design. i'm sure she will! good luck, it seems like a really complex design. 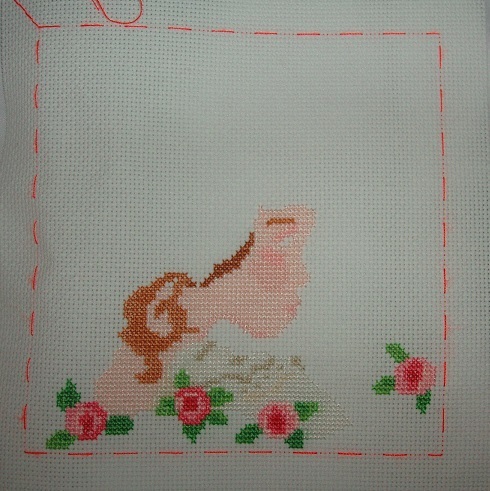 It's mostly whole stitches, and lots of back-stitch, which I happen to like although know a lot of stitchers don't. It's not the most complicated piece I've ever done, but the 20 count fabric makes it a bit fiddly. Still, I'm enjoying it. i do cross-stitch! i'm not very experienced, but i'm in the process of learning to make my own patterns. 20 count is TINY!!! i've never been brave enough to try it. so good on you! Oh, yay! Good for you! I've done a bit of designing in small scale mostly, I used to have a computer program and did some designing in that, and I sort of half designed a piece I posted on my journal some years ago, but mostly I work fro magazine designs, although I often adapt them. I don;t like fractional stitches so I try to not use them, even if the design has them in it. Graph paper comes in very handy! Yeah, 20 count is tiny, I have to take my glasses off to see what I'm doing. 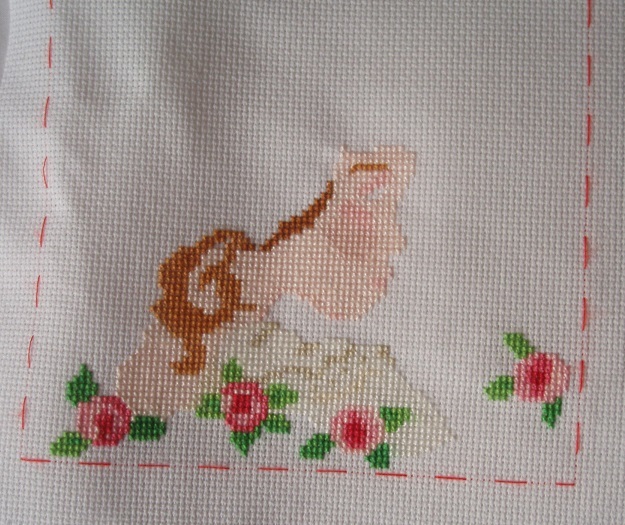 The toughest piece of stitching I ever did though was a Holly Fairy design I did as a card for my mum some years ago on 22 count. That as seriously hard. One of these days I'll find that card again, photograph it, and post a picture. Mum loved the cards I made her. I've still got them all somewhere. She loved fairies. sheeeeeezus, 22 count must be infinitesimally small! i didn't even know they made it that small. i wonder how small it gets? also, how do you make a cross-stitched piece into a card? do you just stick it to the paper, or is there a more complex process? thank you!! i've just made the one design thus far. it's neither very large nor very complex, but i'm happy with it. i get most of my other designs from etsy, though, because that's where you can find the fandom stuff. i think my favorite thing i've ever stitched came from etsy--it's a little sign i keep in my dorm that says BE NICE OR LEAVE. It was rather difficult, the stitches were tiny.You can get 32 count evenweave, but with that you're supposed to stitch across 2 holes so it's like using 16 count. Easier for doing fractional stitches. I tried evenweave once but I didn't much like it. Aida is easier. You can get card blanks that are three-fold with a shaped aperture in the middle section, use acid-free doubled-sided tale to stick your stitched piece behind the aperture then fold one side over and stick it in place with more tape, that's one way, or you can use just an ordinary card blank, fray the edges of your stitching and stick it on the front using double-sided sticky tape. I've used both methods, it just depends on the size and shape of the stitched piece and what looks best. I like the sound of your sign, that's a good thing to have. I've never tried etsy because I already have more than enough designs I want to stitch, but I get my fabric off ebay because you can get real bargains there. Get my threads there too because a single skein is cheaper than in the shops. i cannot imagine something like that... my little seamstress hands are sore after a couple hours sewing on 14-count today. i should really think of making a cross-stitched card sometime! i don't really have a wide variety of things to do with finished pieces--i usually just frame them. i set one in the hoop once, but that was a painstaking process and i don't think it came out very well. i really should have bought the materials for my recent project online. i was thinking about using black aida, but i just settle for white since that's what they had at the store. my pattern called for silver, and the craft store had some fun metallic thread! i decided to give it a try, but it's been pretty difficult to work with. it's a little rough, so it doesn't pull through the holes very well, and it's really hard to thread the needle with it. i couldn't get it to stick to itself with water--i actually had to put some glue on the ends of the thread so i could get it in the dang needle. (plus it cost about five times as much as a regular skein.) but it looks really nice, and will be even better when i'm done! I don't usually stitch for more than an hour or two at a time, too much else to do, but I enjoy it although my fingers get a bit sore at times. Black aida is very effective but hard to stitch on. You need to either put a white pillowcase of something on your lap or have a light shining up from underneath so you can see the holes. Try online for fabric in future, it can be quite a bit cheaper than in the shops. Clear nail varnish dabbed on the end of threads can also help. Might you post pictures of your finished projects? I'd love to see. thanks for all the advice! it's all really useful. i'll get to getting some of those cards, and a needle threader, thanks!!! when i go home for the weekend, i'll put up one or two of my finished projects, plus maybe a process pic of the one i'm doing now? You're welcome, I'm glad I could offer some advice. Good luck with finding what you need. There all all different sizes and colours of cards, and different shaped apertures. And don't forget acid-free double sided sticky tape. It's the best thing to use for mounting stitching to a card. There are probably tutorials on youtube. That would be great! I always love seeing what other people are working on. I just finished a Valentine card. That's a lot of progress in a short time - and she's looking lovely. I can understand you not wanting her looking at you though! Being stared at gets a bit creepy, lol! I've managed to get the best part of an hour every day working on her, and stitching with one strand is faster for me because I don't have the strands twisting all the time. Even so, I'm amazed I've got so far already. It's hard to tell but there are three shades of brown in her hair. It probably shows up better worked in two strands, but I think it'll still look good once the back-stitch is done. I'm sure it will look good. If the shades are quite similar they will tend to blend into each other. I've got a few greens where it's really quite hard to tell them apart. Makes it tricky when working in certain lights, that's why I prefer to stitch in natural daylight. There are so many shades off green, it always amazes me. This one uses three, and there are four or five pinks in each rose. The sheer variety of available colours is one of the things I love about cross stitch. All those tempting skeins on thread!